Last weekend Sue Elliott, Seattle Opera’s new Education Director, and I (I’m Jonathan Dean, SO’s Director of Public Programs and Media) had a great adventure dashing to Houston for two exciting opera performances. On Friday we heard the final performance of Peter Grimes, fourth in a series of Britten’s great operas (the others being Billy Budd, Turn of the Screw, and A Midsummer Night’s Dream) which Houston Grand Opera has been presenting, over the last several years, in partnership with several Australian opera companies. The cast featured Patrick Carfizzi, who will soon be coming to Seattle to sing Dr. Bartolo in The Barber of Seville, as the lawyer Mr. Swallow, as well as Joseph Evans as the Reverend Horace Adams (Evans sang Captain Vere when Seattle Opera presented Billy Budd, in ’01.) 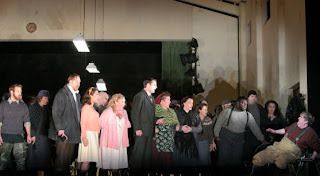 The terrific singers in the lead roles were Christopher Purves, as Balstrode, Katie Van Kooten, as Ellen, and Anthony Dean Griffey as Grimes; Griffey, who sings a great deal of twentieth-century and American music, recorded the title role in Peter Ibbestson with the Seattle Symphony some years ago. Patrick Summers, HGO’s Music Director, conducted a memorable reading of Britten’s harrowing score, performed ably by HGO’s great orchestra and chorus. Intense and beautiful as that performance was, the next night was just as wild: the sold-out world premiere of Cruzar la Cara de la Luna/To Cross the Face of the Moon, a brand-new opera with music by José “Pepe” Martínez, Director of Mariachi Vargas de Tecalitlán, the most important and influential Mariachi group in the world. Created under the auspices of Song of Houston, an ongoing series of new works that uses musical storytelling to engage members of the community who may be new to opera, Cruzar la Cara de la Luna tells a story about family, belonging, and a physical and spiritual journey there and back again between Michoacán, Mexico and Texas. The libretto was written (with Martínez) by Leonard Foglia, who also directed the world premiere semi-staged production last weekend. (Foglia made his Seattle Opera debut in 2005 directing The End of the Affair.) They’ll be presenting a staged production in a few weeks at Talento Bilingüe de Houston. 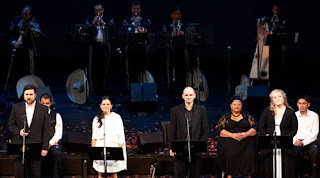 It was a privilege to be in attendance at the world’s first-ever Mariachi opera; the story was deeply moving, and Martínez’s music is justly renowned. To learn more about this exciting new opera, or hear some of its music, CLICK HERE. Beyond hearing these memorable performances, Sue and I had all sorts of culinary adventures with Southwestern and Mexican cuisine--Houston is a great city for opera and for food!